The progresses in nanotechnologies, in particular in electron-beam lithography, allow for the realization of nano-objects with complex shapes. This opens the way to the control at the nanoscale of electromagnetic field intensity and polarization. With the aim of using nano-objects as ultra-sensitive detectors or as polarization-selective antennae, it becomes necessary to understand their response at the level of the single object. 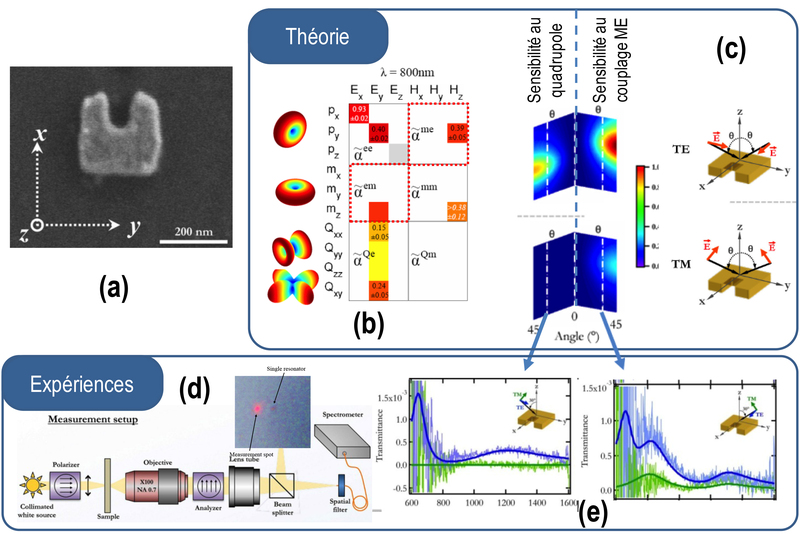 One scientist of the INSP, in collaboration with scientists of Paris Diderot University and Aix-Marselle University, has measured and shown for the first time the peculiar properties of U-shaped plasmonic resonators. The electromagnetic field exacerbation in the vicinity of metallic nanoparticles at the Surface Plasmon Resonance (SPR) is known to enhance the interaction of light with matter and molecules. The increase of intensity at the SPR is already used in the identification and detection of molecules using fluorescence or the Raman scattering. However, to detect selectively organic molecules it is crucial to control in addition the polarization state of the electromagnetic fields. In particular, it is important to favor circularly polarized fields associated with optical activity . Optical activity is described theoretically by the presence of magneto-electric coupling. We have already shown experimentally that optical activity was associated with some SPR in arrays of U-shaped resonators . It is now necessary to propose a general methodology to determine the optical properties of such resonators and to confirm experimentally the presence of magneto-electric coupling at the level of the single resonator. This work has been done on single resonators realized by electron-beam lithography (Figure (a)). The optical response of one resonator is described by its polarizability tensor which relates the polarizability moments of the resonator to the exciting fields (Figure(b)) as well as to their spatial derivatives. Recent calculations have shown that the polarizability tensor can be cast in a 6x6 tensor . This involves the determination of 36 coefficients with complex values ! Based on our previous results, we have shown that this number of coefficients may be reduced to 7 (Figure (b)). (a) Geometry of one isolated resonator realized by electron-beam lithography, (b) Prolarizability tensor of one resonator and radiation patterns of the different moments. The contribution of the magneto-electric coupling is underlined by the red dotted lines. (c) Calculated intensity scattered in the forward direction between crossed polarizers as a function of the propagation direction and polarization. (d) Schematic of the experimental setup used in the measurements. (e) Intensity scattered in the forward direction measured spectroscopically between crossed-polarizers (thin lines) and calculated using our theoretical model (thick lines). One important simplification comes from the possibility to describe the dependency of the polarizability moments to the spatial derivatives of the fields by a polarizability tensor which no longer depends on these derivatives (Figure (b)). It is then possible to calculate numerically the electromagnetic field scattered by one resonator in the far field as a function of the propagation direction and polarization of the exciting field (Figure (c)). In particular, we have shown that the magneto-electric coupling could be identified by the existence of light forward scattered in a polarization orthogonal to the incident one (Figure (c)). The presence of quadrupole moments (Q) can be identified independently (Figure(c)). To confirm these theoretical predictions, we have realized transmission measurements using a confocal microscope developed that the Institut Fresnel (Figure (d)). This microscope allows both the visualization and the spectroscopic measurement of the optical response of one single resonator. Measurements in cross-polarizations at oblique incidence (Figure (e)) validate our theoretical predictions (Figure(c)). In particular, we have used two different planes of incidence and two different incident polarizations yielding 4 measurements configurations. The experimental results can be perfectly reproduced with the model developed by adjusting the strength of the contributions of the multipoles in the polarizability tensor. We then show the presence of magneto-electric coupling and, as a consequence, of optical activity at the length scale of the single resonator. These results open the way to the control of both intensity and polarization state of the electromagnetic fields in very small volumes. Such resonators may be used in the realization of ultra-sensitive detectors with polarization selectivity.